These beautiful buses have the most modern amenities available. From great accessibility with front-kneeling capabilities, to an inside aisle height of more than six feet, to our GPS tracking system, we put your group’s safety and comfort first. These beauties also are built with an American-made Cummins-Allison power train, have a sumptuous touring-coach interior, a high-quality heating and air conditioning system, plenty of luggage space, and even a spacious bathroom! For the especially safety conscious, we are happy to report that our new mid-sized coaches are of monocoque (from the French for single-shell) structure in stainless steel making them extra durable, safe, and fuel efficient; nice to the planet and your budget! Great trips on your horizon for 2018! 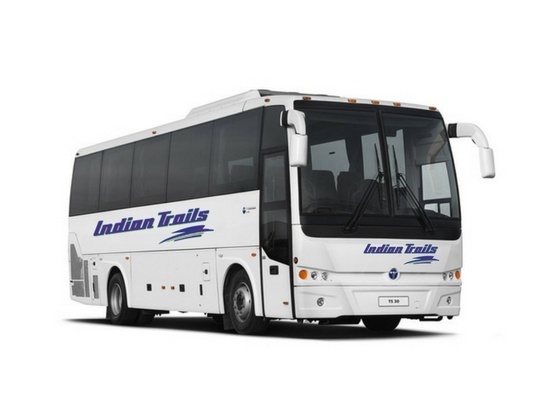 Whether you want to plan a trip across the state or across the country, Indian Trails has the coach for you! Contact us today for assistance planning your trip or request a quote for your group!